Liquid error: undefined method `select!' for #<ContentNode::ActiveRecord_Associations_CollectionProxy:0x000055b3bc11a510> Did you mean? select _select! The first time I presented a paper at an academic conference, I was accused of being nostalgic. My mistake, as my fellow academic pointed out, was that in my bid to find some value in working-class occupational cultures I was guilty of backward looking romanticism. It wasn’t meant to be constructive criticism, but over the years I’ve developed a longstanding interest in the idea of nostalgia which is often attached to working-class life. So I’ve been especially interested in the ways that political developments on both sides of the Atlantic have involved nostalgia as the backward-looking voters supported Brexit in the UK and Trump in the US. We may see more of this in France, with support for Le Pen later this year. Charges of nostalgia in these situations refer to a whole range of stances and attitudes, from the more benign sentiments of those who want a return to full industrial employment or desire a greater sense of community to those who more darkly ‘want their country back’, which too often is code for freedom to discriminate. Looking beyond recent elections, we can to detect a backward-looking trend in television, in programmes such as Call the Midwife, Downton Abbey, Mad Men, Endeavour, or the new Netflix series, The Crown. In politics and popular culture, many seem to be happiest when living in the past. However, by using the term nostalgia as a catchall criticism we often miss the complexity and nuance involved, and class often has a big part to play here. Those who study nostalgia note that it almost always tells us more about attitudes toward the present than views of the past. It is precisely because people feel unsettled about their current unstable situation and unknowable future that they seek solace in the comfort of the past. Scholars also point out that nostalgia is very rarely ‘simple’ in the sense that people want to live in the past. They are almost always critical, even reflective, about both the present and the past, and they find something of value in that past that may have been lost. I woke up Friday morning to the news that my country decided that it no longer wants to be part of the European Union. With a large turnout of 72% of the eligible electorate, the vote went 51.9% in favour of leaving against 48.1% for remaining – 17.4 million against 16.1 million, in case you wondered. As a result, the clock has begun to tick down on 43 years of British EU membership, creating huge levels of uncertainty. This morning the pound sterling lost 10% of its value against the dollar – the biggest one day decline since 1985 – and a massive £200 billion was wiped off the stock market. But what was behind this result, which seemed until the eve of poll to be heading towards remaining in the EU? Class was one of the biggest factors. Let me explain. Early analysis of the results shows that if you had a college degree or were young, you were more likely to vote to remain. Geographically, England and Wales voted for Brexit, except for London. Scotland, however, voted overwhelmingly to remain, opening up a very real prospect of another independence referendum and the disintegration of the UK. Many places in England and Wales outside London, often but not exclusively Labour Party traditional heartlands, were amongst the strongest supporters of leaving. This seems to have resulted from a cocktail of resentments against ‘them’, the ‘elite’, the ‘establishment’ or simply the ‘experts’. This resentment has been simmering in these Labour heartlands for decades and predates the banking crash of 2008. Resignation, despair, and political apathy have been present in many former industrial regions since the wholesale deindustrialisation of the British economy in the 1980s and 1990. The election of the Blair -led Labour administration of 1997 masked the anger felt in these areas as traditional labour supporters and their needs were often ignored, while traditional Labour supporters were used as voting fodder. Over the thirteen years of Labour power, that support ebbed away, first as a simple decline in votes, but gradually turning into active hostility to the Labour party. Many embraced the UK Independence Party (UKIP). This opposition, so skillfully drawn on by the leave campaign, is in part a working class reaction not only to six years of austerity but also to a long and deep seated sense of injustice and marginalisation. Most of the remain side, which was a cross party grouping, didn’t seem to understand this before the referendum and, even more depressingly, doesn’t seem to understand it fully now. A stock characterisation of working-class people who intended to vote leave was to label them as unable understanding the issues, easily manipulated, or worse, racist ‘little Englanders’. A number of commentators have understood the class resentment underlying the referendum. In his thoughtful video blogs preceding the vote, Guardian journalist John Harris travelled away from the ‘Westminster village’ to the more marginal, often over looked parts of the UK. What he observed was precisely this class demographic of voting intentions, people who were in effect members of what sociologist Guy Standing has called the precariat. Fellow Guardian columnist Ian Jack wrote a similarly powerfully reflective piece linking the working-class vote with deindustrialisation. Both Harris and Jack emphasize the point that for unskilled workers with only a secondary school education, three decades or more of neo-liberalism has left deep scars socially, politically, and culturally, with little hope or expectation that anything would change for the better. In a vox pop radio interview the day before the referendum, a person stopped for their views simply said, ‘The working class is going to get screwed whether we stay or leave, so we might as well leave’. A couple of weeks back I learnt of the death of one of the signalmen I used to work with on the London Underground. Geoff Revell, who died of cancer at the age of seventy-three, had been active politically and in the union since the 1960s. The jungle telegraph of retired and still active underground workers ensured that nobody who had known Geoff was unaware of his passing or the subsequent funeral arrangements. I owed Geoff a lot, although I never really got the chance to tell him. I first came across him when I was a green kid just beginning on the job. I wrote an impatient snotty letter to my union branch secretary demanding to know why that year’s union diary had failed to show. Geoff wrote back a letter explaining patiently that the diaries had not been distributed because of the death of the branch secretary. He went on to list the various activities and priorities for the branch still mourning its leader, including dealing with hundreds of industrial injury claims and, in the nicest possible way, hinted that my diary could wait. At the end of the letter he suggested that I might want to become involved in the branch in order to lend a hand. I was there at the next branch meeting. Geoff’s response was perfectly pitched, offering a between-the-line rebuke to a stupid kid with the wrong priorities but worded positively enough to get him involved in something much bigger than himself. By the early 1980s, Geoff was a full-time union representative on the Underground, where he was known affectionately as the ‘Perry Mason of the Disciplinary Board’ because he never lost a case! Stories about Geoff’s interactions with management were legion. One that stuck in my mind, although I suspect it’s at least an exaggeration, was that he once had the management representatives crying at a disciplinary hearing for a worker accused of stealing. The worker got off the charge. Geoff embodied working-class pride and confidence. He was quick witted, incredibly funny, and had a comic’s sense of timing when telling stories, as is clear in a video of him paying tribute to the late RMT leader Bob Crow. 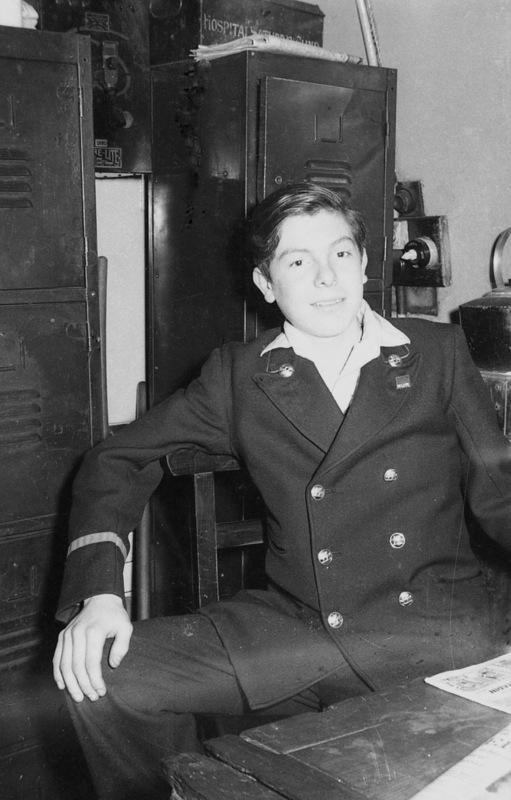 Last week a friend of mine forwarded a photo of an unnamed teenage London Underground worker from the mid-1950s. My friend sent it to a group of current and former workers, asking – six decades on –for the kid’s name. The picture is a kind of time capsule from an early post-war London now long gone. The boy wears a style of uniform that lasted for decades, a variation on military clothing with its the orange piping, silver buttons, and his union badge. The photo informally preserves an important piece of working-class heritage. Working-class workwear, including uniforms like this, evoke interesting ideas. For those who have to wear them, they can be a really mixed blessing. They can serve as a source of pride, the signifier of a respectable, secure steady job with pensions and prospects. This was certainly true of the Victorian and Edwardian uniformed working class. A railway worker I once interviewed told me that on his first day at work in the late 1960s he begged, borrowed, and stole various bits of uniform so that he could walk home as an ‘adult worker’. Uniforms can also be sites of contestation and discipline. When I worked on the Underground three decades ago, managers could pull you up for relatively minor clothing infractions. Also, y plastering their lapels with union badges and other political pins, workers could display their oppositional intent. One of the problems I regularly encounter teaching undergraduate students sociology is their use of the term ‘post-industrial’ in their essays, by which they often mean that countries like the UK no longer have industry or the jobs that went with it. I have to point out that the UK still has around five million industrial jobs out of an active labour market of over thirty million workers. OK, it’s not the seventeen million workers that once populated the mines, factories, shipyards, and other plants when Britain was the workshop of the world, but it does represent a substantial number of predominately working-class jobs.